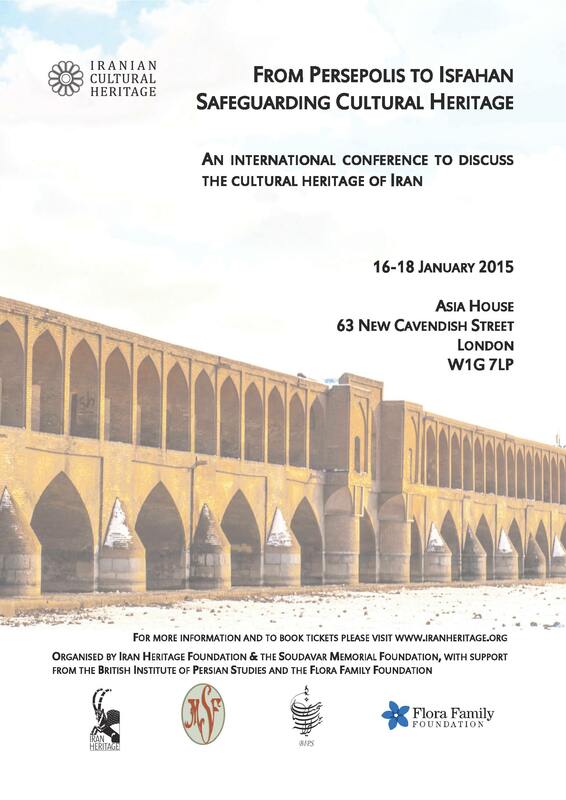 his conference focused on protecting the cultural heritage of Iran. As is well known cultural heritage worldwide is under threat, and from many countries there are stories of damage to monuments and archaeological sites allied to ongoing deterioration of cultural resources. At present, the problem is particularly acute in Iraq and Syria due to military activity and state-sponsored vandalism. Fortunately these problems do not exist in Iran. Nevertheless, monuments and archaeological sites are susceptible to damage caused by acid rain, sandstorms, earthquakes, floods, neglect, looting, and urban development. The aim of this conference was to review the extent of the damage, to raise awareness of the problem, to look at the framework within which protection is currently provided, to chart best practice worldwide, and suggest some practical measures to help and support Iranian colleagues. On behalf of the Soudavar Memorial Foundation I would like to welcome and thank the speakers and the guests for their participation and truly heart-warming interest. About three years ago, when I drew attention to the importance of Iran’s deteriorating natural and cultural heritage, I hardly imagined that my appeal would bear fruit so soon, but one can count on Vahid and Maryam Alaghband to make things happen. After last year’s highly successful environmental conference, our joint collaboration with Iran Heritage is focusing this year on cultural heritage, with the support of BIPS and the Flora Foundation. Let us hope it bodes well for collaborative efforts on cultural heritage at a time and in a neighbourhood where we have seen the testimony of great civilizations suffer serious and at times irreversible damage. Cultural heritage is no less important than natural heritage. What biodiversity is to nature, cultural diversity is to identity and to its creative genius in all its manifestations. While the former is vital to our physical survival, the latter is essential to our understanding of who we are and as a source of inspiration to be drawn upon by generation after generation. Iran is particularly fortunate in being blessed with a diversity of monuments and archaeological sites that chart the progress of civilization not only on a national level but on a global scale. This renders the conservation of Iran’s rich heritage all the more urgent as it faces challenges from natural erosion, environmental pollution, vandalism, ignorance and bad taste, mindless urban development, and last but not least indiscriminate sanctions that affect both natural and cultural heritage to the detriment of all . We cannot afford to remain indifferent, if only for the sake of future generations. Although the challenges faced by Iran’s heritage are neither as dramatic nor as immediate as in Iraq and Syria, where part of an equally diverse and rich heritage is irretrievably lost, longer term the potential risks may prove to be as damaging if we do not act now. That is why we are assembled here with dedicated experts who have devoted their talents to the study and salvage of a heritage which we share with the world as our contribution. I would like to conclude with an episode from the life of my mother, a known patron of the arts, who passed at age 101 last June. Years before she donated her art collection to her father’s endowment, the Malek Library and Museum in Tehran, where it can be seen in a special wing dedicated to her memory, she was sitting in her house in the centre of Tehran surrounded by her cherished artworks as missiles poured down at the height of Iran-Iraq War. Despite entreaties she refused to take shelter and abandon her collection to vandals and looters. To her the sanctity of cultural heritage was greater than the sanctity of human life. She viewed artistic creation as the material manifestation of the best that human genius can produce, and it outlives (or should outlive) our mortal coils to provide lessons from the past for future generations. It is in that spirit and in tribute to the sanctity of human genius that we are proud to support the cultural heritage of Iran as an integral part of human heritage.